4. 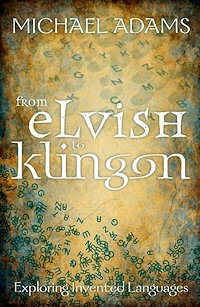 Reviews: From Elvish to Klingon. Two readers queried the pronunciation that I gave two weeks ago for siccity. On going to dictionaries of the nineteenth century, the most recent that included a note on how to say it, I found that they gave it as /ˈsɪksɪtɪ/, roughly “sik-sity”. I’ve corrected the website’s piece. Beat Many readers were surprised that the ancient parish ceremony of beating the bounds wasn’t mentioned in the piece. In the days before maps, the only good way of keeping boundaries fresh in the minds of inhabitants was to make a regular formal circuit, stopping at key landmarks. Boys armed with willow or birch rods beat the landmarks to help them remember their importance. Sometimes the boys were themselves beaten to reinforce their memories. Though the ceremony no longer has any useful function it is maintained in a few places as a tradition. It is unclear to what extent, if at all, beating the bounds contributed to the idea of the regular beat of a police officer. English borrowed this potentially useful word from French about two centuries ago, though it has long since abandoned it again. A search of newspaper archives suggests that it’s used nowadays merely as a rare word with which to stump contestants in US spelling bees. The French continue to use it, hyphenated, for the bird that we call a flycatcher, appropriately so since it is made up of gober, to swallow, and mouche, a fly. In French it also means a credulous person who accepts everything said to him as the plain truth. These people are great gobemouches; they always report the most incredible things. Travels in the Great Desert of Sahara, in the Years of 1845 and 1846, by James Richardson, 1848. The inescapable image is of a naive individual thunderstruck by the world around him, perpetually open-mouthed in astonishment and ready to swallow whatever came his way, whether flies or tall tales. This sense of the word is said to have been popularised in French through a play of 1759 by Charles Favart, La Soirée des Boulevards, which featured a character named Gobemouche. It’s tempting to see a connection between gobemouche and gob, that infelicitous monosyllable which has been a British dialect and slang term for the mouth since the sixteenth century. The similarity is an accident of etymology, however, since gob is most likely to be from the Gaelic and Irish word for a beak or mouth. Words of the year Christmas has nearly come and dictionary makers have begun their annual trawl for the word or phrase that best characterises the months we have just lived through. First off is the venerable Oxford English Dictionary, whose British shortlist includes two terms that are new — Arab Spring and sodcasting, the latter sounding ruder than it really is, since it’s a play on podcasting and refers to somebody listening to music through the loudspeaker of a mobile phone while in a public place. The other three are not new but have taken on new importance or new meanings this year — Occupy (the international movement protesting against economic injustice, taken from “Occupy Wall Street”), hacktivism (the action or practice of gaining unauthorized access to computer files or networks in order to further social or political ends) and phone hacking (gaining unauthorized access to data stored in another person’s phone). The winner, however, is squeezed middle, a short form of squeezed middle-classes, which was first used by former PM Gordon Brown at the Labour Party conference in 2009. It’s that part of society that’s regarded as particularly affected by inflation, wage freezes, and cuts in public spending during a time of economic difficulty. It’s a mark of the global nature of the current economic meltdown that both US and UK editors of the OED selected this as the term that has had the greatest resonance in 2011. Non-U A term they might have included, though it hasn’t gained the level of recognition of the others, is Generation U. This has been used for the unretired generation, those who are staying in work when they might have retired. It has shifted its meaning this year so that the “U” stands for unemployed, in reference to what some are calling a lost generation of young people who are going from school into long-term unemployment without ever knowing work. What’s in a name? Did you see the story this week about the newly discovered orchid that flowers only at night? The piece about it in my newspaper listed other plants that flower similarly, including the night-blooming jasmine, the queen of the night cactus, and the midnight horror tree. This last one sounded like one to avoid, even more so after a search unearthed other names for it: the broken bones tree and the tree of Damocles. The last of these came about because of the metre-long curved seed pods high in the tree that resemble scimitars hanging over one’s head. When they fall to the ground, they look like a pile of broken bones. Why midnight horror is less easy to work out, though perhaps coming across a pile of bones in the deep dark would be sufficiently frightening. Curiously, the tree — incidentally, pollinated by a bat — has long been known as an important medicinal source in Asia. Country classes We’ve got used to PIGS, an acronym for the four EU countries with the most severe economic problems (Portugal, Greece, Spain and either Ireland or Italy, or sometimes both, making PIIGS). Then there’s BRIC (the developing countries Brazil, Russia, India and China, though India hates being called “developing”), which is now often extended to BRICS to include South Africa. That country also appears in another acronym — CIVETS (Colombia, Indonesia, Vietnam, Egypt, Turkey and South Africa, six countries with diverse economies and a young, growing population) — that the British press has popularised this week because of an official visit by Juan Manuel Santos, the President of Colombia. CIVETS was coined by Robert Ward of the Economist Intelligence Unit in 2009. The history of invented languages ranges from the philosophical languages of the seventeenth century to modern creations linked to books, films and games. Some are long-established, such as J R R Tolkien’s Elvish languages Sindarin and Quenya, well-developed tongues created by a linguistic scholar that are woven into The Lord of the Rings. George Orwell created Newspeak in his 1984, a regularised and pared-down English designed to make it impossible to even think anything that didn’t conform to the beliefs of his dystopian state. In A Clockwork Orange, Anthony Burgess used Nadsat, an argot based on Russian, to characterise the worldview of the book’s violent gangs. Followers of the Star Trek SF franchise will have encountered the Klingon tongue, originally a few phrases introduced to give colour but later worked up by Klingonists into a tongue in which it’s possible to perform Shakespeare. A more recent case is Na’vi, the speech of the natives in Avatar. The development of computer games has led to several languages — mostly only partially developed — that include Gargish, D’Ni, Simlish, Al-Bhed and Logos, to help provide a flavour of the culture of groups being portrayed. Last modified: 26 November 2011.